An extraordinary mythology has grown up around the Third Reich that hovers over political and moral debate even today. Adam Tooze's controversial new book challenges the conventional economic interpretations of that period to explore how Hitler's surprisingly prescient vision- ultimately hindered by Germany's limited resources and his own racial ideology-was to create a German super-state to dominate Europe and compete with what he saw as America's overwhelming power in a soon-to- be globalized world. The Wages of Destruction is a chilling work of originality and tremendous scholarship that is already setting off debate in Germany and will fundamentally change the way in which history views the Second World War. Adam Tooze is the author of The Deluge, winner of the Los Angeles Times book prize in history.. He is the Kathryn and Shelby Cullom Davis Professor of History at Columbia University. He formerly taught at Yale University, where he was Director of International Security Studies, and at the University of Cambridge. He has worked in executive development with several major corporations and contributed to the National Intelligence Council. He has written and reviewed for Foreign Affairs, the Financial Times, The Guardian, the Sunday Telegraph, The Wall Street Journal, Die Zeit, Sueddeutsche Zeitung, Tageszeitung and Spiegel Magazine, New Left Review, and the London Review of Books. "One of the most important and original books to be published about the Third Reich in the past twenty years. A tour de force." "Tooze has produced the most striking history of German strategy in the Second World War that we possess. This is an extraordinary achievement, and it places Adam Tooze in a very select company of historians indeed ... Tooze has given us a masterpiece which will be read, and admired; and it will stimulate others for a long time to come." 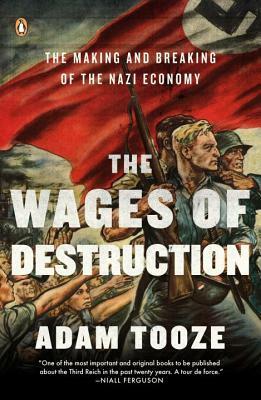 "It is among Adam Tooze's many virtues, in "The Wages of Destruction: The Making and Breaking of the Nazi Economy," that he can write about such matters with authority, explaining the technicalities of bombers and battleships. Hovering over his chronicle are two extraordinary questions: how Germany managed to last as long as it did before the collapse of 1945 and why, under Hitler, it thought it could achieve supremacy at all." "Virtually every page of his book contains something new and thought-provoking, making the whole an impressive achievement, in which original research has been combined with critical scrutiny of a vast literature that seems ripe for such a re-examination." "A magnificent demonstration of the explanatory power of economic history." "Masterful . . . Tooze has added his name to the roll call of top-class scholars of Nazism."